A zombie apocalypse may seem too far-fetched but we live in a crazy world and anything can happen. It is better to be prepared for the unforeseen than to be caught unawares. Which begs the question, what are tools and weapons that should be on your survival kit should there be Zombie apocalypse? If you are a fan of the walking dead you know Zombies can come out from thin air and they don’t give you time to make split second decisions. 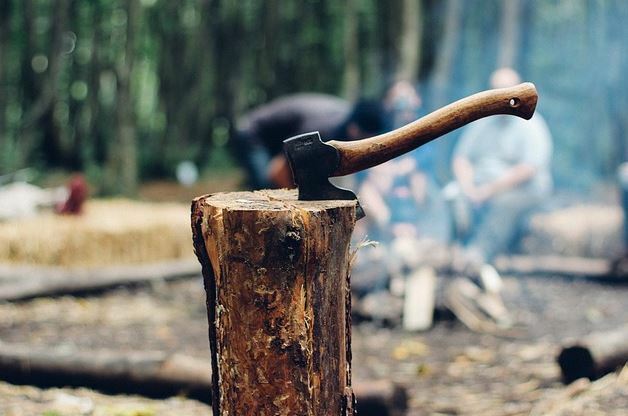 Having a full tang survival axe or hatchet could mean the difference between life and death. With an Axe, you have a firm grip on the weapon of choice and it is very hard to miss the target. A gun may jam on you when you are in real danger. Supplies of ammunition could also be a serious challenge during an apocalypse and you will need all your weapons functional for your survival. An axe might also come in handy for subsistence needs. You will need food to survive and an axe can come in handy when hunting for small animals like rabbits. You will also need firewood to cook. This is why an axe or hatchet is essential in any DIY survival kit or bug out bag, more than even rifles and guns. It is a multi- functional tool that can keep you alive in case of a zombie apocalypse. An axe or a hatchet is a must have in your DIY zombie apocalypse kit or bug out bag to increase your chances of survival. Doom preppers know how essential it is and they sometimes include several in the kit. A zombie apocalypse might be a thing you see in Hollywood movies but it is better to be safe than sorry. Even if an apocalypse never happens you can use it for cutting wood when you go out on a hiking, backpacking, camping, fishing or even hunting trip.